In the spirirt of the Marx Brothers films, this page is presented to you in glorious black and white. Someone had a really good idea. They wanted to find out everyone's favorite Marx Brother and film. I intended to run this for a month, but my schedule forced it to two. Internet Movie Database listing for Groucho, Chico, Harpo, and Zeppo. Yahoo! 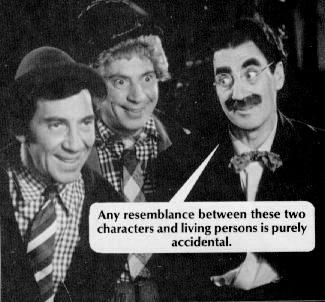 's listing for the Marx Brothers. Why a Duck? - A very cool page that I overlooked last update. Go here to find more sound files, images, and your Marx - loving company. If you don't want to go there, then at least check out their Remote Quote. And, at numerous requests, the lyrics to Lydia, the Tatooed Lady! (Please forgive my spellings of proper names. Please e-mail me any corrections you may have, and I'll try to fix it up. Be warned!!! Lydia is 2.0 Megs in size!!! Chico is 1.2 Megs, and Hello, I must be going is half a Meg. Do not download these if you have a slow modem, or you will regret it!! Well, I thought my razor was dull until I heard his speech. And that reminds me of a story that's so dirty, I'm ashamed to think of it myself. A severly irritated gentleman: Sir, you try my patience. Groucho: I don't mind if I do. You must come over and try mine sometime. I think you've got something there. And I'll wait outside until you clean it up. I could dance with you till the cows came home. On second thought I'd rather dance with the cows till you came home. 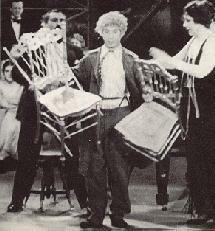 Driftwood (Groucho): Is the opera over yet? Doorman: Not yet, signor. In a few minutes. Driftwood (to carriage driver): Hey you! I told you to slow that nag down.On account of you I almost heard the opera! Now then, once around the park and drive slowly. Arabella (Lillian Roth): Oh, Mr. Ravelli, I want you to do something for me. Ravelli (Chico): I do anything for you. What you want I should do? Arabella: You see that painting? Ravelli: You mean this piksh? Arabella: I want you to take that out of the frame and put this one in its place. Ravelli: You want I should take this one 'a down put this one upstairs. Ravelli: You want I should steal? Arabella: Oh no. It's not stealing. Ravelli: Well, then I couldn't do it. Three Cheers for Captain Spaulding! Three Cheers for Captain Spaulding! Driftwood (Groucho): That woman? Do you know why I sat with her? Dirftwood: Of course! That's why I'm sitting here with you, because you remind me of you. Your eyes, your throat, your lips, everything about you reminds me of you, except you. How do you account for that? Mrs. Teasdale (Margaret Dumont): I've sponsored your appointment because I feel you are the most able statesman in all Freedonia. Rufus T. Firefly (Groucho): Well, that covers a lot of ground. Say, you cover a lot of ground yourself. You better beat it. I hear they're going to tear you down and put up an office building where you're standing. You can leave in a taxi. If you can't get a taxi you can leave in a huff. If that's too soon, you can leave in a minute and a huff. You know you haven't stopped talking since I came here? You must have been vaccinated with a phonograph needle. Connie (Thelma Todd): Oh Professor, you're so full of whimsy. Wagstaff (Groucho): Can you notice it from there? I'm always that way after I eat radishes. So now I tell you how we fly to America. The first time-a we start-a, we get-a half way across when we run out of gasoline and we gotta go back. Then I take-a twice as much-a gasoline. This time we were just about to land, maybe three feet, when what do you think? We run out of gasoline again. And back we go again and get-a more gas. This time I take-a plenty gas. Wella we getta half way over ... when what do you thinka happen? We forgota the airplane. So we gotta sit down and we talk it over. Then I getta the great idea. We no taka gasoline. We no taka the airplane. We taka steamship. And that, friends... is how we fly across the ocean. That's a fine way to carry ice. Where are your tongs? Groucho: How about you and I passing out on the veranda, or would you rather pass out here? Woman: Sir, you have the advantage of me! Groucho: Not yet I haven't, but wait till I get you outside. Firefly (Groucho): Not that I care, but where is your husband? Mrs. Teasedale (Margaret Dumont): Why, he's dead. Mrs. T: I was with him till the very end. Firefly: Huh! No wonder he passed away. Mrs. T: I held him in my arms and kissed him. Mrs. T: He left me his entire fortune. Bortcha motcha..."Kiss me quick; I'm double parked." Tutti Minooti... "Help, help! I've been bitten by a snake!" Dabisco si ... "Have you fed the cat?" I must not leave Harpo without some reference to his wonderful sense of sportsmanship. If, in chasing a blonde across the stage or screen, he caught her - and found her to be undersized - he would throw her back. Chico: I'll take two beers, too. This page is Netscape 2.0 Enhanced. Missing out on the features of 2.0? Then you must be a person who's been getting nothing but dirty breaks. Well, we can clean and tighten your brakes, but you'll have to stay in the garage all night. Pictures and text are taken from the books "Why a Duck?" (1971) and "Hooray for Captain Spaulding!" (1974), both edited by Richard J. Anobile. .au files were taken from the World Wide Web. .wav sounds were sampled with my own equipment from the MCA Universal videotape releases of the Paramount Pictures Animal Crackers (1930) and Duck Soup (1933), and the MGM Picture A Night at the Opera (1935). The song, Lydia the Tatooed Lady, was sampled from the MGM Picture At the Circus (1939), as shown on Cinemax. Return to Brad's Highly Experimental Home Page. 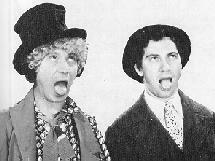 Marx Brothers fans have vitisted since Sept. 11th, 1996.